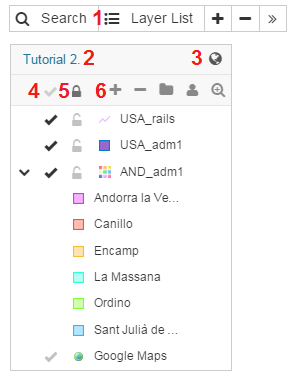 The Layers list shows all of the layers of a selected project. The Layer list also functions as a legend. Map name – Click on the map name gives map permalink. Publicly available – Map is publicly available, you can change it by click on the icon. Check box – Toggles layer visibility on or off. Lock layer – Features can’t be selected.